It was the leaders’ day at the U.S. 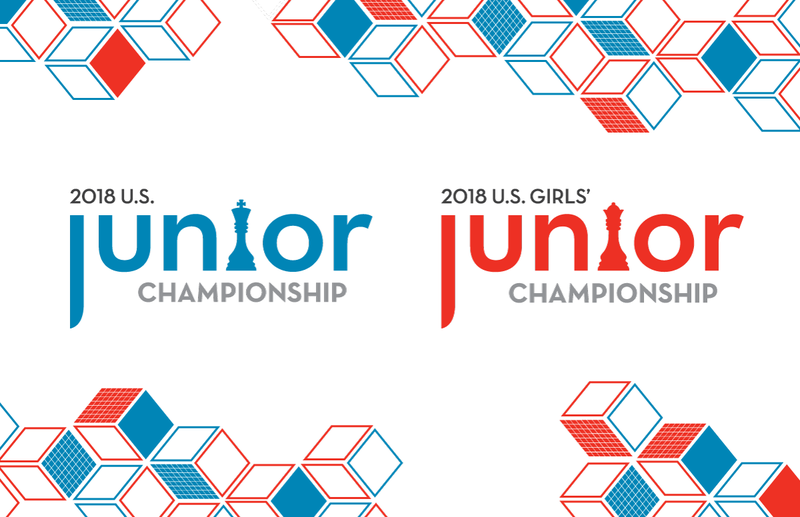 Junior Championships! Awonder Liang and Carissa Yip have extended their leads with just one game to go. 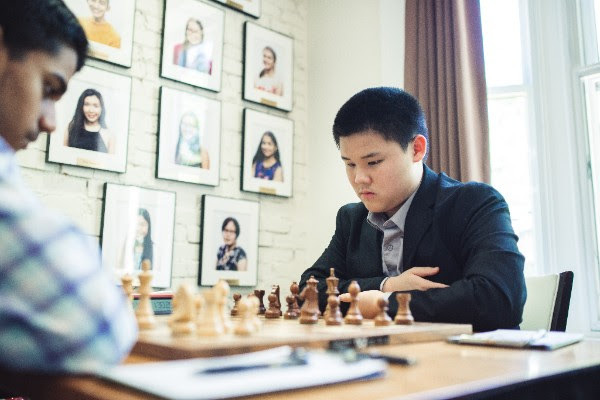 Awonder Liang faced one of his closest rivals, Praveen Balakrishnan, in a 70-move close battle. In the middlegame, Balakrishnan advanced many of his pawns assertively, gaining extra space on the queenside, center, and kingside. The game opened up, and queens were traded, leading to a dynamic endgame. Despite the high amount of active play, chances remained equal until the very end. On move 67, Balakrishnan blundered in a drawish position, allowing Liang to promote his b-pawn and win. Mika Brattain won a key upset game against Akshat Chandra. In a double-edged Najdorf Sicilian, Chandra gained the better attacking position due to his superior bishop on the d5 outpost compared to Brattain’s very blocked bishop on g7. However, Brattain fought back, breaking out his bishop to the c1-h6 diagonal and activating his pieces to bear down on Chandra’s king. In the end, Brattain’s attack prevailed. 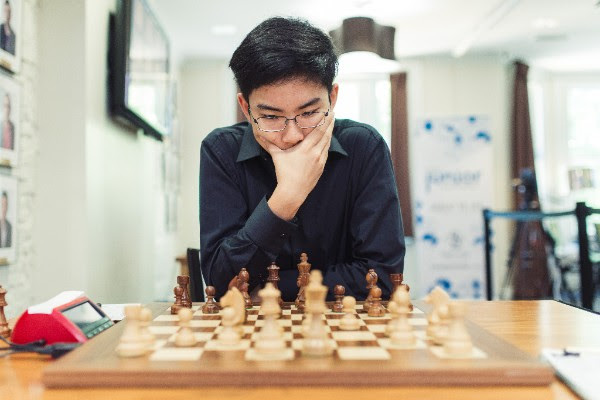 Alex Bian gained a considerable edge against Ruifeng Li by sacrificing the exchange in the early middlegame. In the resulting tactical complications, Bian gained control over the center with his incredibly well-placed minor pieces. However, Bian missed a critical opportunity to activate his rook and gave up his advantage to win back his sacrificed material. Bian then traded into an inferior bishop and two pawns vs. rook endgame, which Li slowly ground down into a win. Andrew Tang achieved his first victory of the championship against Annie Wang. After an inaccuracy by Wang on move 30, Tang broke through with 31. Rd7+ to gain a winning king attack. 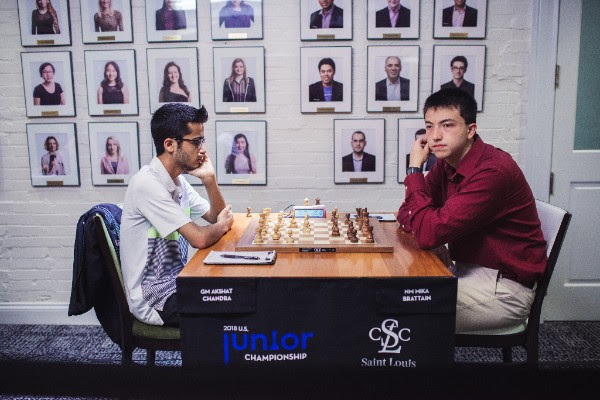 John Burke vs. Advait Patel featured a hard-fought game in the Ruy Lopez Breyer Variation. Although Burke obtained kingside pressure and Patel gained an octopus knight on d3 plus pressure against Burke’s b2 pawn, chances remained level for most of the game. The players agreed to a draw in an equal endgame. With a victory for Awonder Liang and all of his closest competitors drawing or losing, everything went Liang’s way this round. He enters the final round with an entire point edge over the field. Advait Patel, the leader in the early rounds of the championship, is the only player who can catch him. Patel must win at all costs with white against the top seed, Li, to have any chance. Carissa Yip also had an excellent day at the board. After a blunder by Maggie Feng, Yip broke through in the center with the shot, 27...Rxd3! This gave Yip two extra pawns and a dominating position, which she soon converted into a victory through tactical means. 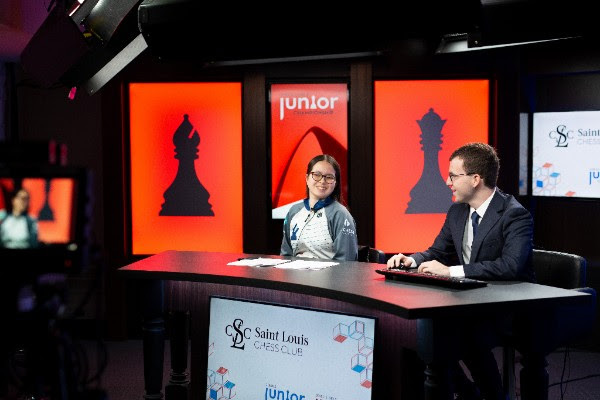 In a reverse Sicilian, Jennifer Yu tried to turn her extra pawn into a win for 67 moves before sharing the point in a drawn knight ending. This result keeps Yu in contention for 1st, trailing Yip by a point. Emily Nguyen was also pushing for a win against Thalia Cervantes, trying to stay in the running for the championship. She tragically blundered on the 94th move in intense mutual time pressure, losing an otherwise drawn queen ending. Sophie Morris-Suzuki once again showed the benefits of her renewed approach since the rest day. 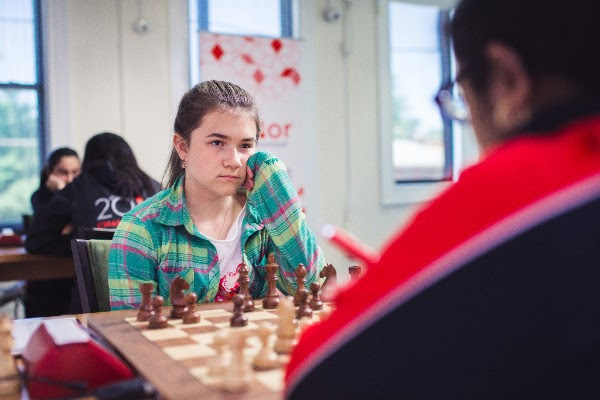 After a miscalculation by Rochelle Wu, Morris-Suzuki coasted to victory with an extra knight. Vittal Sanjana vs. Nastassja Matus featured energetic play by both players in a middlegame with the kings castled to opposite sides. Though Matus had the upper hand for most of the game, the players eventually repeated moves in a opposite-colored bishops and rooks ending. Carissa Yip has emerged from the penultimate round a full point ahead of everyone. 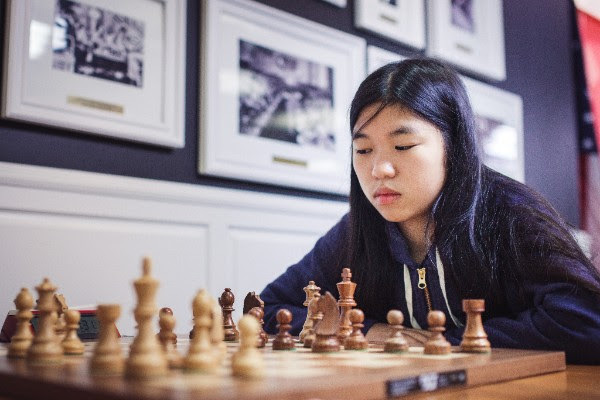 Jennifer Yu is the only player who can tie her score and faces a must-win battle against Yip tomorrow with the white pieces!